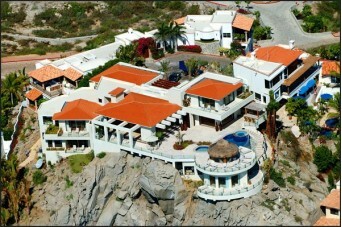 Villa Penasco is located just minutes from the town of Cabo San Lucas. 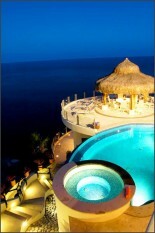 Villa Penasco is a luxury private villa located in the elite community of Pedregal de Cabo San Lucas. It has five bedrooms and six bathrooms and is a private estate situated on top of a high cliff overlooking the Pacific Ocean and “Lands End” where the Sea of Cortez meets the Pacific Ocean. It is within easy walking distance to town, and there are also three fabulous beaches located nearby which makes its location superb. The villa includes five full time staff who will make your stay at Villa Penasco a memorable one. The landscaped area surrounding this luxury villa is approximately 2700 square feet, while the interior of the house is approximately 10,000 square feet. There are five bedrooms so ten guests can be comfortably accommodated. Each bedroom has a full marble bath, private terrace and magnificent views over the Ocean. Each bedroom is also fully equipped with a telephone, internet access, TV/DVD/VCR player, wall safes, and private ensuites with Gilchrist & Soames amenities. There is a large, spacious living room which offers amazing views and plenty of comfortable seating. There are three large, 4-seater leather sofas, several arm chairs and two rocking chairs. The large stone fireplace is a special feature of the living room, and on either side of it is a large flat screen television and stereo system. The living room opens out onto the large terrace. The dining room can seat up to 16 people, and also opens out onto the terrace offering superb views. Two beautiful square dining tables can either be set up together or separately. The main terrace is extremely spacious and has plenty of seating and lounging areas. It offers magnificent views over the famous Lands End Rocks. The heated pool has an infinity edge with a waterfall. Both the pool and the hot tub also offer great views over the water. The board room located on the 2nd level in the West Wing – this room can function as a mini-cinema, a conference room or even an extra bedroom! It is equipped with a 52 inch television with DVD and VCR player and a full stereo system. There is a three seat leather sofa, and six reclining arm chairs with built in foot rests. The room can hold up to 16 people for a conference. There is also an office located on the main level which offers basic business assistance such as fax machine and photocopier. The fitness room is located on the lower level and has a variety of machines, weights and yoga and Pilates mats. Villa Penasco is fully equipped with a wide range of amenities and activities for the guests to enjoy. There is a fully equipped mini cinema which can also be used as a board room. There is also a fitness room, huge DVD library, wide range of games, high speed internet access through out the whole house, computer station, book library, pool and hot tub, and satellite TV. Nearby there are also tennis courts which can be reserved for a nominal fee. Villa Penasco can also offer spa services to its guests in the privacy of your own room or on the terrace. Alternatively, the staff can also make appointments for you at a specialized spa facility.